A display apparatus secured to a temple or bridge contacting portion of an eyewear, the apparatus including means for monitoring the wearer’s heart rate, lap position, laps completed, time elapsed, etc. An image of the collected data is transmitted into the wearer’s field of view by means of a fiber optic element and projected at a focal point within the focusing range of the wearer’s eyes. This may not be the most significant acquisitions of intellectual property from Google, especially with the recent announcement of Google’s $900 million opening bid for around 6,000 patents from Nortel’s patent portfolio, but it does show that Google’s founders follow their own interests and take them very seriously. Google’s self driving cars were a dream of Google founder Lawrence Page since his days as a doctoral student. Sergey Brin is an avid swimmer and diver, in part to help stave off the possibility of Parkinson’s Disease. In a 2007 biography piece, Sergey Brin’s father was quoted as saying that when he asked his son if he were taking any advanced classes at Stanford, Sergey responded, “Yes, advanced swimming.” So, perhaps this acquisition isn’t that odd. The goggles seem pretty interesting and potentially very useful for the health conscious and for competitive athletes as well. The patent also notes that an impact sensitive switch built into this system could be set so that it turns on upon the impact of a dive into the water, or that it could use an infrared signal “attached to a starters gun, bell, or buzzer” for other athletic activities such as running. I did find a story about an earlier version of the goggles from inventor Harry Linden, but I don’t know if the ones described in this patent were ever developed. It’s possible that they have been. I wouldn’t mind a pair myself. While Google’s main focus still seems to be on search and on mobile devices, I don’t think we should be surprised in the future to see co-founders Brin and Page following their muses and bringing us things that might even be wilder than self driving cars and electronic goggles that can monitor pulse rates and blood pressure and elapse time. With the departure of Eric Schmidt as CEO of Google, and what seems to be more of a focus upon Google engineers running the show, we may start seeing some interesting and unexpected things coming out of the Googleplex in the future. Actually, Bill, I think this patent makes a lot of sense for Google. I believe they have been looking for a completely personal interface solution for a long time. Such a contraption might lead to some interesting new breakthroughs. Ha awesome! I would love to see Google come out with some crazy stuff like this. I wouldn’t mind having a car that could drive itself sometimes! And good point Michael…It might seem on the surface like an isolated eccentric patent, but when you really think about it they are laying the foundation for human-computer interface. Very very cool. This must be google planning on monetising vision. Must be a way to combine streetview, googlemaps and adwords together into a web3.0 realtime, as-you-walk visual display, complete with information (and adverts) on everything the user sees. Genius / worrying / magnificent / terrible. This is just one step closer for Google finishing up creating the matrix. I don’t get it though. Why would google want a patent for goggles? What would Google gain wanting to add a patent to goggles? Hard to refute that possibility. Not quite as stylish looking at the Yahoo Goggles I wrote about a year ago, but the features that these goggles offer could be improved upon in a number of ways. Give them an IP address, and you could start sending information back and forth. It’s possible that there’s more to these goggles than just Sergey Brin’s affinity for swimming and diving, but they’re pretty neat just in that context alone. I’d consider buying a pair for running or walking or working out if it would tell me things like my pulse or blood pressure. Will it become part of some kind of human computer interface? When I saw the name Linden attached to the patent, my first impulse was that it was somehow related to Linden Labs, creators of Second Life, and people who have worked on some HCI stuff before. While inventor Harry Linden isn’t associated with Linden Labs, this is still a pretty interesting invention, and there are some interesting possibilities that could build upon it. Will we see that from Google? Not sure. But even if this was acquired based upon Sergey’s interest in swimming, I wouldn’t be surprised if someone at Google decides to improve upon it. Sounds like Arnold Schwarzenegger’s vision in the Terminator Movies (plus street views). The view point of the goggles, at least how they are shown in the image from the patent, just aren’t big enough to provide that rich an amount of detail. But I’m not sure that the images filed with the patent would really limit what could eventually be done with them. Funny that virtual reality company Autonomy just announced the release of their smartphone virtual reality product Aurasma, and the New York Times blog announcement mentions the possibility that they might use a virtual reality version of Adwords to make money with. Will Google get there first? Sometimes it does feel like we’re living in a science fiction movie. That’s part of why I found the acquisition of the patent odd. Maybe Sergey has one of the older versions of the Goggles, and grew disappointed that the inventor was granted this patent but never developed the advanced version that starts up upon impact when you dive? Or maybe Google has some plan to build onto these goggles some information system. Science Fiction author Vernor Vinge wrote a book in the 90s called Rainbow’s End which had people using contact lenses as a computer interface to see information and view the world as augmented reality, where they could change the look of the world around them. I don’t know if these goggles are a step towards such an invention, but it’s a possibility. Its interesting that they are willing to pursue something like these goggles, which don’t seem tied to the core objectives of their business. But, the goggle’s themselves are pretty interesting, and the possibilities that may be associated with them may definitely be worth pursuing. Google has a pretty wild array of patents at this point, many of them having very little to do with the search Biz. Honestly, to pull from an earlier comment of mine concerning the Exbiblio technology acquisition, I think this is really once more step toward terminator vision. Visual recognition is just part of the puzzle. The next step is projecting data back to the user via an interface on or near the eye. This goggle patent does just that. That’s my take on it. Terminator vision. Hi Bill, I have been an avid Google follower for a long time (buying novels about their rise), reading blogs and following their amazing purchases. One book rightly suggested that to become truly embedded in society, that they would need to make some bricks and mortar purchases. Extensions such as online search coupled with real world search (trackers, bar code scanners, smart meters etc) all make sense. Its like the reverse of the lawn mower man, they are looking at products to liberate them from the computers. On a less serious note, love the googles (goggles?). I can see that many execs up before dawn absent mindedly swimming in their luxury lap pools will want to keep count and compare notes. Its like the water version of nike’s shoe tracker for the ipod. And of course it should have a proximity sensor so people don’t swim into walls will thinking deeply about online problems. Just great to see big companies thinking outside the square, everywhere. Thanks for this Bill, another enjoyable read that no doubt took a lot of your time to research and prepare. Have you ever thought about becoming a book author? I’d be very keen to see an advanced title about internet marketing with your name on the cover. As a non-engineer who can see the forest for the trees, I see this as a mind-blowing opportunity to use the goggle design for something far more visionary. It’s not a play on o’s and g’s. The swimgineer sees something we don’t. Interesting. It’s really nice to know that Google never stops making itself a one stop shop for their patrons. I really enjoyed the read. Thanks for sharing. They bought the patent so they now can WIPO or buy the domain name goggle.com. Once they buy or win the domain they will simply point the users to Google.com. Try going to http://www.goggle.com, its an advertiser page. Google doesn’t care about goggles. This is almost definitely the beginnings of the physical embodiment of the “Google Goggles” project. You might recognize the name from the incredibly awesome smartphone app of the same name. It has been said by Google that the goal is to provide a realtime information overlay…I think they even had an example video of what they’re envisioning. That’s one of the questions that I was asking myself when I first saw this patent. I suspect that there’s potentially a fair amount of value to people who are swimming or running or working out and who want to monitor things like pulse rate or blood pressure carefully. Do these goggles have value beyond that? I’m not sure. The interface that’s presently in use for the goggles looks like it’s intended to be pretty non-intrusive. But, it’s possible that it could be built upon in a few ways. Is the technology in this patent a way for them to move into something more complex, providing a wider array of information? Maybe. Interesting thoughts. The people who make money from gold rushes are the ones seeing the shovels and picks. The thing I like about the goggles are that they both help protect your eyes while swimming, and give you instant access to information that you want to see without forcing you to stop from what you’re doing. The purchase may or may not have been inspired by Sergey Brin’s interest in swimming, and there may be more to it than that, but I agree with you that it’s great to see them focus upon some things outside of search. Thanks. I’ve thought about writing a book or two, and turned down an offer on one a few years ago, but it’s a real possibility for the future. I’m thinking there may be more there, too. Google doesn’t seem like the type of company that takes a step without thinking a few steps ahead of that first one. I thought about Google’s growing visual search when writing this post, and I did even blog about Google Goggles a few times, including one back in December of 2009, in How Google Might Let you Shop by Camera Phone. 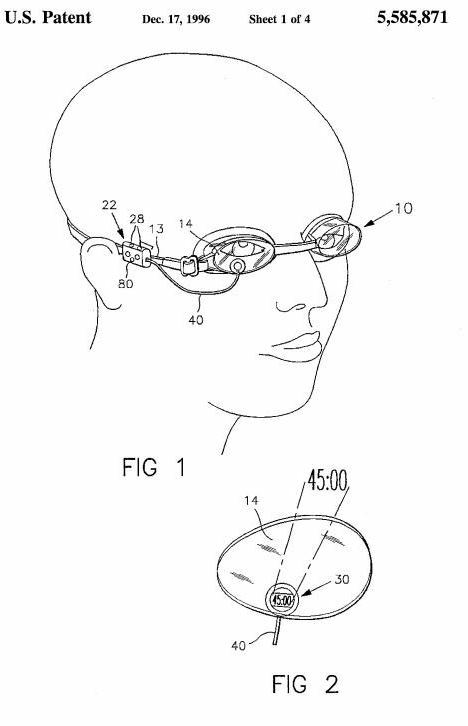 One thing that kept me from explicitly drawing a connection between these swimming goggles and Google Goggles in my post is that the patent really doesn’t lend itself towards being an interface for a visual search system at this point. At least not in the way the swimming goggles are described in the patent filing. I’m not sure that Google really needs this patent to build upon to develop a system that can bring visual search results to you as you’re viewing the things that might be searched. But then again, maybe it would be helpful. I guess you have to spend money to make money and if you have it why not dabble in some other areas. It typical for entrepreneurs do do other things, it is somewhat of a challenge thing to see if you can succeed in other areas. But, the Google/Goggles thing is quit funny and interesting…is that a coincidence or is there a alternate goal with the whole thing.. very interesting. Thanks for sharing the post. Not sure if there’s some kind of hidden goal involved in the acquistion of this patent, or if it was acquired solely because Sergey Brin wanted to see the technology hinted at in the patent actually developed. I would suspect that if it were, that it could lead to other uses of the Goggles, so it seems like it is something that could lead to more than just a way of monitoring how many laps you’ve done in a pool, or what your heart rate is after a few minutes of running. I’ve linked to the patent that I’ve written about, and you’re more than welcome to follow the link if you would like. It does descrive the use of a monitor attachment that fits within a pair of swimming goggles as well as other devices that might be attached to the goggles themselves such as sensors that might detect an impact with water. There’s no mention of the name “timewindow” within the patent though that’s something that might have been trademarked by Lindon (you could check with TESS if you really want to know). The lens device includes a lens joined to a lens holder member, the lens holder member having a diverging wall portion that permits suction mounting of the lens device onto a substantially smooth surface. The lens is held by the lens holder member to permit a field of view through the lens and through any surface upon which the lens device is mounted. The lens device is thus conveniently mountable upon the lens of an eyeglass or goggle, the screen of a monitor or radar scope or any other device where it would be beneficial to magnify a selected field of view. Suction mounting of the lens device permits easy removal and relocation of such device on a selected surface or relocation onto an entirely different surface. The lens device is also combinable with an appliance such as a digital stopwatch to provide a module that is suction mountable onto a pair of goggles. A swimmer is thus enabled to keep track of elapsed time while swimming. Previous Previous post: Google’s First Bid on Nortel Patents a Transformative Moment? Next Next post: Time to Add Query Breadth to Your SEO Glossary?